A frothy white head stands in contrast to the orangey body, throwing off aromas of mango and tangerine.The hops dance nicely between adding citrus flavors and balancing dryness. Long finish, blending final herbal impression and hop flavors. A couple of weeks ago, my buddy Ken asked if I wanted to grab a beer. I got there a little early, and saw they had Odell IPA on the menu. I hadn’t had that yet, and since we are new to Arizona I am trying all of these new brews. I ordered one and fell in love with the beer the second I poured it into the glass. The aroma was incredible, and the aftertaste lasted for a really long time. 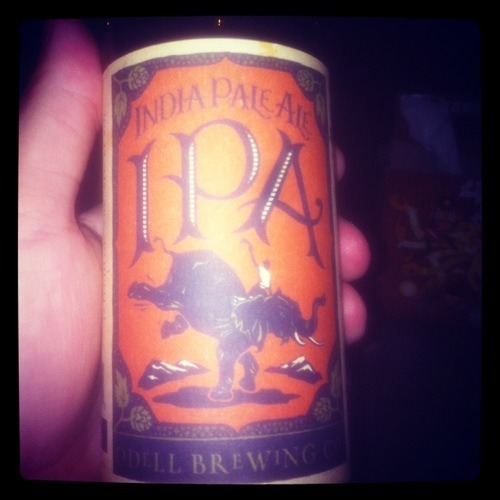 I am a big IPA guy… but this one takes the cake. Tonight we are drinking from Papago Brewing. This place is sweet, and is quickly becoming our favorite place in the Valley. They have a great beer selection (both bottles and on draft) and their food is pretty good. I am hoping we can get them as a sponsor for the 1001 Bottles project. Anyway, let’s drink! In the Glass: When we ordered the bottle, the server said, “1 bottle. 2 glasses.” He brought us two small glasses, and poured the beer for us. The beer is somewhat orange, and has a weak head and almost no lace. Nose: The aroma is amazing. It is like a glass full of hops. The aroma sticks around for a while, and just punches you in the face. I love it. It smells like an American IPA is supposed to smell like. Let’s see what she tastes like. Flavor: Oh. My. God. This beer is loaded with flavor, but it doesn’t knock you out with bitterness. There isn’t a lot of carbonation and the mouthfeel is just so smooth. The flavor is just what I expected from a good IPA. Mouthfeel: A lot of IPAs have a ton of carbonation, but this one is surprisingly smooth. It starts off soft, and then the hops just kick in and overwhelm the palate. That is when the aftertaste starts and just hangs on for a LONG time. Aftertaste: It’s still there. Man, this aftertaste is wicked. It isn’t overwhelming, but it does have a consistent flavor that just hangs on for dear life. Just when I think it’s time for another drink, I swallow… and there is the bitterness from those hop varieties. The burp is pretty great, too. This is such a good beer. I am such a big IPA guy that finding a new “go to” IPA is always a good thing. I am not familiar with the Odell portfolio, but I can’t wait to try more. There are a few more on our list, and I am excited to try them all. Bottoms up, people! Today we are blogging from Papago Brewing in Scottsdale, AZ (our new home). This place is really, really cool. To me it’s almost like the 3 Floyds of Arizona. Very indie, with plenty of taps and a ton of bottles for sale. Definitely check it out if you are in the Phoenix area. Ricky said this is a really good IPA. I guess we will find out. It looks kind of like honey in the glass. Not much lace in the glass, but that’s good to me. It smells really hoppy, which is very typical of an IPA. Let’s find out how it tastes. This is a pretty good IPA. I’m not sure I would say that it’s my favorite, but it’s not bad. It’s a very solid IPA, I would say. Hoppy, but a very clean kind of hoppy. It leaves just the right amount of aftertaste. I think if I was looking for an IPA to drink, I might pick this one again. Good taste for an IPA, I like it. In this one, we talk about w00tstout, some beer news, and our upcoming trip to Vegas. Podcast #2, and we're slowly improving. This one includes pictures! Trust the Austrians to make this dream a reality. The Starkenberger beer pools were created by the Starkenberger Castle's brewery located in the tiny town of Tarrenz.